Abu Dhabi, UAE, 24 February 2019: Ferrari World Abu Dhabi witnessed approximately one hundred Ferrari owners drive their luxury vehicles through the park on Saturday, February 23. 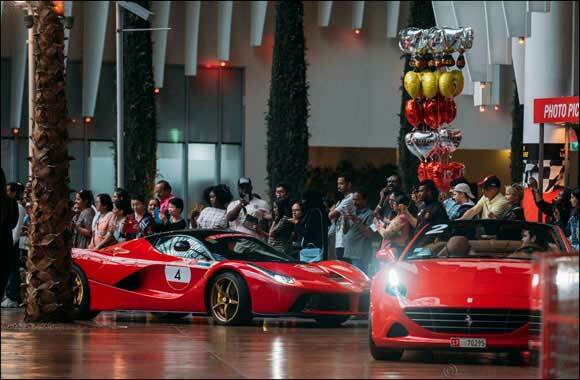 Ferrari owners and collectors from all over the world came together under the iconic red roof of Ferrari World Abu Dhabi as part of the UAE’s first Ferrari Cavalcade. Park guests admired the stunning designs of the world’s most desired sports cars which inspire the record-breaking rides and attractions of the Middle East’s leading theme park. The parade’s appearance at Ferrari World Abu Dhabi added even more excitement to the park’s thrilling experience. The annual global event presented Ferrari’s international customers with a unique opportunity to witness the Emirate’s diverse terrain at the wheel of their own stunning sports cars.